"Guided tours will be provided at the Nordic on Sunday, February 17th. 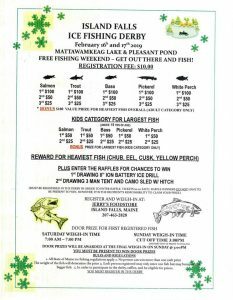 Meet at the lodge at 1:00 to head out. Snowshoes are provided while supplies last. Rentals are $2/each or free with a Nordic Membership. You may also bring your own" (https://www.facebook.com/events/262600237936634/). 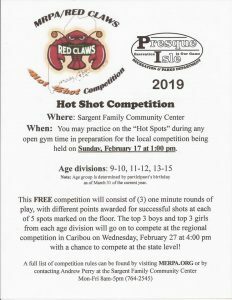 The Sargent Family Community Center (SFCC) will be the site of the Hot Shot Competition on Sunday, February 17, starting at 1pm. FMI contact Andrew Perry at the SFCC by calling (207) 764-2545 (http://centralaroostookchamber.com/event/hot-shot-competition/). On the third Sunday of each month, Everyone Cares dinners are held for seniors at the Houlton Recreation Center, from 3pm to 4pm. Please join us!